In April of 1981, the American space shuttle Columbia first took (glorious) flight, and model and toy makers anticipated another "space toy" boom. 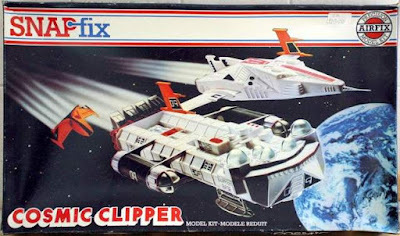 Airfix got into the act with the release of a second "composite" spaceship model kit like Starcruiser One (1979), but this time without the imprimatur of Gerry Anderson. he model kit came in 55 pieces, was a "snap fix" toy, and consisted of a large command ship, an attack interceptor, and a shuttle. The command section had small transparent domes at the fore, and the shuttle looked like a mini-Concorde, perched on the rear. The Cosmic Clipper was re-released in 1982 and 1983, and it was one of my favorite models from my childhood. I love how the design seems to a blend of so many different 1960s-1970s influences. Looking back at the kit and my memories of it, I remember that the nacelles were easily removed, and handily re-positioned across the command craft. They could stand out at the sides, or be attached from above, which gave the Clipper a very different look. You could even stand them at a diagonal position, and have the craft look something like a Starfleet freighter. 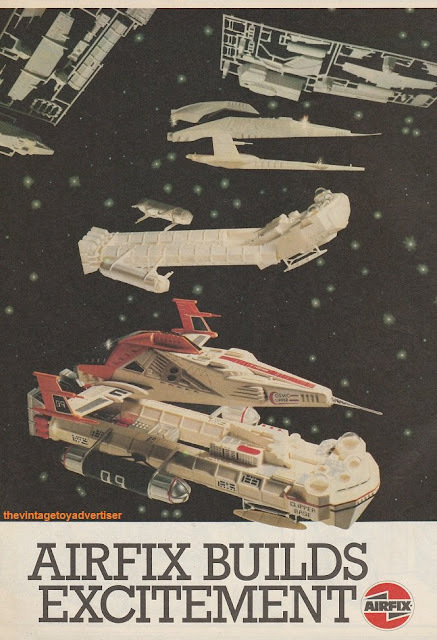 While writing this Memory Bank post I found a print ad on the web for the Cosmic Clipper, posted by the vintage toy advertiser, in which it is stated that Airfix "builds excitement." That was certainly the case for me, as an eleven year old, endlessly fascinated by space ship toys and models that were not from any particular franchise. With an original design in hand, it was up to me to decide what kind of universe the ship would fly in, and what characters would take the helm. 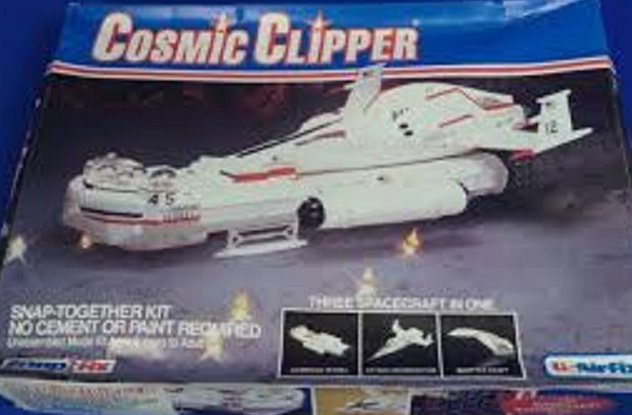 I've had a lot of luck over the years getting old kit from my childhood on E-Bay, but I've never managed to get my hands back on a Cosmic Clipper!